Well known to curiosity seekers who are willing to pay a dime to see her. Her body, from the neck down, is covered with varied colored patterns. 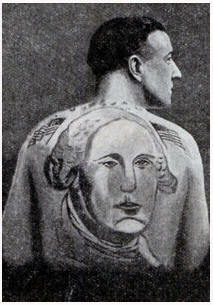 The patriotic motif shown has the picture of George Washington tattooed on his back. His chest is similarly adorned with patriotic emblems in a multitude of colors. INTEREST in tattooing has been revived by a book that covers the subject thoroughly and frankly. 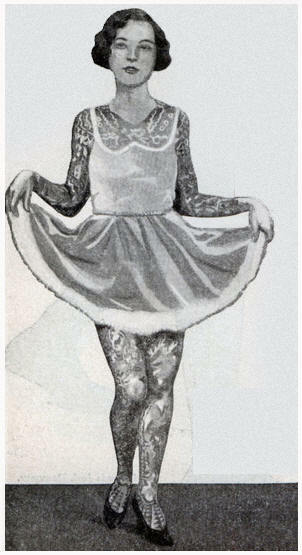 “Tattoo” by Albert Parry, makes many startling revelations. For instance, it is surprising to learn how many women, even in society circles, adorn their physical charms with multi-colored figures of butterflies, hearts, cupids and initials of loved ones. However, the greatest masterpiece in the tattoo art are found among sailors and among the professionals, those who place themselves on exhibition at circuses and museums. Selected illustrations from Parry’s book are. well known tattoo artist of the present day, is pictured here decorating the back of a young woman who plans a circus career. 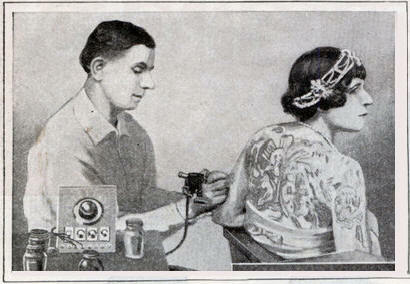 Note the ultra-modern electric tattoo needle equipment, allowing faster, more accurate drawings. 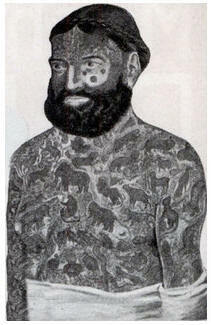 The world's most famous tattooed specimen. He was brought to the U. S. by the late P. T. Barnum, circus man extraordinary. Every part of Constantine's body was tattooed. Barnum paid this highly decorated Turk $1,000 a week and dubbed him "The Living Picture Gallery." There were 388 separate designs tattooed on his body.